Palate--Mature wine going over the hill but characteristic, mature fruit flavors of dark berries and spices with an earthy touch. 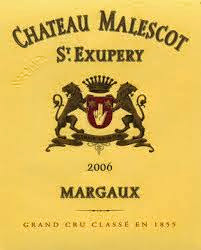 Finish lingers with a gentle reminder of mature Margaux Grand Cru Classe. Chicago guest brought this for Thanksgiving and it will be a wonderful pairing. It is ready NOW and needs to be drunk immediately so don't tarry! Expect to pay over $50 if you can even find it. A perfect Thanksgiving pairing! A nice treat to highlight a nice day of giving thanks to the One from whom all blessings flow.